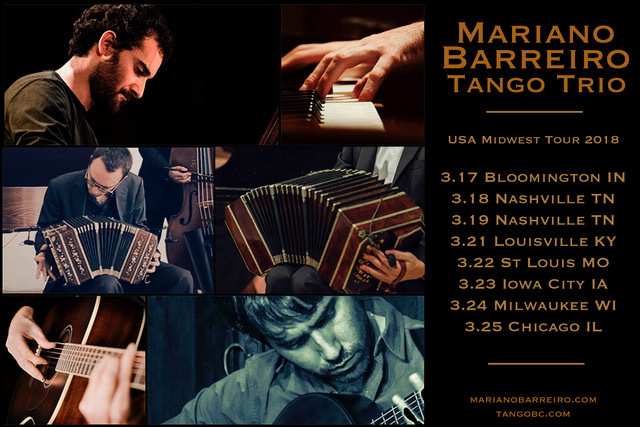 We are excited to host the Mariano Barreiro Tango Trio from Buenos Aires and San Francisco for a night of live Tango music and dancing! Come to dance or just to listen and watch! Mariano Barreiro, pianist and arranger born in Buenos Aires, Argentina in 1983. In his vast artistic tour, Mariano has integrated with tango, jazz and Argentine folklore ensembles. Mariano has presented concerts in Europe, North America and Asia; performing in concert halls and milongas. He recorded his first tango duo album with Santiago Cursach and the special participation of musicians of the stature of the violinist Pablo Agri, the bandoneonist Horacio Romo and contrabassist Horacio Cabarco. He has made musical arrangements of tango for international productions and artists, amongst which stands out the international singer Candi Sosa de Cuba. Mariano has also participated in international festivals including the International Festival of Tango of Tallinn (Finland), Tangopostale Festival (Toulouse, France), Red Carpet Tango Festival (Las Vegas, NV USA), Festival of the Five Continents (Switzerland) as well as Festival de Tango (Buenos Aires, Argentina). Santiago Cursach, guitarist, arranger, composer and teacher of tango and folklore. Santiago has toured Europe and North America giving concerts in concert halls and milongas. Some notable shows and events include: Festival of Tangopostale of Toulouse (France), Festival of the Five Continents (Switzerland), Festival de Tango (Montreal, Canada), Red Carpet Tango Festival (Las Vegas, NV USA), Tango de Tampere (Finland), Festival de Tango (Buenos Aires, Argentina). He has also performed at milongas in Russia and Germany. Santiago has arranged and recorded CDs of tango, folklore, bosa nova, samba and rock. He has recorded with celebrated musicians such as maestro Horacio Romo, the violinist Pablo Agri, singer Esteban Riera and bassist Guillermo Ferrer (musician of Osvaldo Pugliese’s Orchestra), amongst other recognized artists. Bandoneonist, and leader of the acclaimed bay area sextet Redwood Tango Ensemble, Charles Gorczynski composes music without stylistic restrictions, fundamentally centered in tango with influences in modern jazz and contemporary chamber music. He has toured extensively in North America and Italy, including performances in San Francisco, Los Angeles, Portland, Seattle, Chicago, Montreal, New York, Pisa, and Rome. Redwood Tango Ensemble was the featured orchestra for Chicago Tango Week 2013 and 2015, and has shared concert bills with Kronos Quartet, Del Sol Quartet, Rob Reich Quintet, and members of Tango Sin Fin. Charles was a guest bandoneonist with the California Symphony and San Jose Chamber Orchestra, toured as bandoneonist with the Argentine ensembles Tango BC Trío, Mariano Barreiro Tango Trio, Alejandro Ziegler Quartet, and premiered his own works with the Chamber Music Northwest Summer Festival in Portland. His compositions and collaborative works have been released with the record labels 482 Music, Serein, Ropeadope Records, and Front Forty Press.